Your grip will depend on the type of shot you play. There are two basic types to choose from for both the backhand and the forehand. Choose a style you find most comfortable. You will know you have it right when your racquet comes to feel as a natural extension of your arm. The examples given are for right-handers - if you are left-handed simply do things the opposite way round. Weekend tennis players should not spend much time on perfecting certain shots such as the top spin or lob; however, the different grips are important. If you know the different grips and understand the benefits of them, then you will become a decent player with limited practice. To become a top-notch player, you need to spend several hours trying to perfect the top spin. Also players at higher levels must master how to hit the ball when it is on it's upward flight. If you are only concerned with being the recreational player then you will probably want to focus more on hitting the ball when it is on it's way down. This will allow you to control your shots. Stay in the game . Which Grip is Best for YOU? The type of tennis grips you use will have a huge bearing on the types of strokes you develop, and on your overall game. The Continental is the one grip that you can use for every shot, but that hasn't been standard practice since the days of long pants and skirts. The Continental is used primarily for serves, volleys, overheads, slices, and defensive shots. 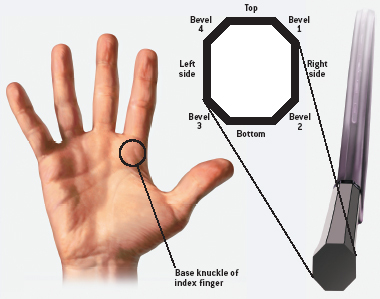 Find the Continental by putting the base knuckle of your index finger on bevel No. 1, which puts the V created by your thumb and forefinger on top of the handle. Lefties put the knuckle on bevel No. 4. * Place your hand flat against the strings and slide it down to the grip; put the racquet flat on a table, close your eyes, and pick it up; or shake hands with the racquet. These are just a few of the tricks you can use to find an Eastern forehand grip. The more technical way is to hold the racquet in a Continental grip and then turn your hand clockwise (counterclockwise for lefties), so that the base knuckle of your index finger slides over one bevel. # This is the most simple, natural and reliable grip and the one most beginners should adopt. It is known as the eastern grip or shake-hands grip because as you take hold of the racket it should feel as if you are shaking hands with another person. Curl your fingers around the grip near the base so your thumb and forefinger form a V along the top right edge of the handle. This grip places the palm of the hand directly behind the handle. As you stroke the racket through on the forehand side, it should feel almost as if your hand is hitting the ball. The classic Eastern forehand groundstroke gets most of its power from linear motion -- from the legs, body, and arm moving forward and upward. The body is completely turned sideways, and the forward motion of the stroke has been set up by the left foot's large step toward the net. The standard backswing on this stroke has the racquet pointed at the back fence. Moving your knuckle one more bevel clockwise (counterclockwise for lefties) from the Eastern forehand grip puts you in a semi-Western grip. This has become a prevalent grip for power baseliners on the pro tours, and many teaching pros encourage their students to use it. More experienced players adopt a more advanced forehand grip known as the semi-western. It is the grip adopted by most of the professionals on the tennis tour because it is the best way to add top spin. Andre Agassi, Jennifer Capriati and Martina Hingis, who have three of the best forehands in the business, all use it. Whereas in the eastern grip the palm sits behind the handle, with this grip it lies underneath. This time your thumb and forefinger should form a V pointing into the side of the handle. An easy way to find this grip is to simply put your racket on the floor and to pick it up by the grip, this will be pretty much a semi western grip. It will feel awkward at first but once mastered, will allow you to return high bouncing balls with more power and aggression than a normal grip. These grips also help keep the racket head stable when the ball is being struck. That's why pros are increasingly turning to a Western or Semi-Western grip. The disadvantage of a Western grip is that it is difficult to hit low-bouncing balls. For this reason some sports scientists are still promoting the more traditional Eastern grip. Place the palm of your hand on top of the handle then move the racket inwards a quarter turn. 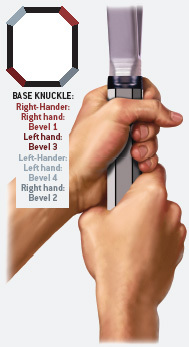 The thumb should fall diagonally across the back of the grip, though some players wrap it all the way round. The direction does not matter but it it important that the inside of the thumb is touching the flat part of the handle. An easy way to find this grip is to put the racket under your left arm with the handle sticking out forwards. Grab hold of the grip and pull the racket out, you should then have the correct grip for a one handed topspin backhand. The Full Eastern backhand grip (sometimes called Western,) centers your palm on the top plane of your racquet handle. This grip offers the most solid support for the racquet, whether you're hitting topspin or slice, but it requires a point of contact well in front of your body, which causes some players to meet the ball too late. Such players often find the Eastern (sometimes called modified Eastern) grip a little easier. Beginners are encouraged to learn to play shots on the backhand side with two hands. There's no doubting the popularity of this grip, but there is some debate about the ideal way to position both hands. This grip gives extra strength and control than a one-handed grip, especially for junior players. It is also easier to hit top spin. On the downside, it gives you less reach and you need more time to prepare than with a single-handed shot. So it's important if you use a two-handed backhand that you also develop a one-handed slice as another option. The simplest way to formthe doubled-handed grip is to hold the racket with your dominant hand in the shake-hands forehand grip, then add the other hand with another forehand grip. Once you have mastered that, start to nudge your right hand grip more onto the top of the grip. This will allow you to hit with more power and spin. Either way, your hands should be bunched up against each other, but not overlapping. When hitting a ball backhand, it's easier to generate topspin if both hands are on the racket. Two hands around the racket also helps players disguise where they're going to place their shot. Tilt the face of your racquet down more on your backswing. Your racquet face naturally opens up (tilts upward) as you swing forward. You need to start your swing with it facing somewhat downward in order for it to end up at vertical as it meets the ball. Hold your racquet face vertical at the point where you normally meet the ball, then, without turning your wrist(s), pull the racquet back to your normal backswing position. It should face somewhat downward, and that's the angle you want at the start of each swing. Your racquet head might be drooping below your hand(s) at the point of contact. The long axis of your racquet should be horizontal on impact. If the head is much below your hand(s), you'll tend to "golf" the ball upward. Hit with more topspin. If you brush up the back of the ball, the spin you'll create will make the ball fall faster as it flies forward. In general, a consensus is emerging that the two-handed backhand is more effective than the one-handed. An increasing number of players are already using two hands for the shot, particularly in the women's game. Service Grips - For the service grip, the two most commonly used tennis grips are the Eastern forehand grip and the Continental grip (and anywhere in between). While many great champions have possessed great serves with various grips, the vast majority of great servers have tended far more towards the Eastern forehand grip. Volley Grip - The grip most preferred by great volleyers is, like the serve, the Eastern forehand "shake hands" grip. It's extremely practical to use this grip as it doesn't require a grip change from forehand to backhand volley, and, in many cases, from the serve or to the smash. While the above offers a guide to tennis grips, I can't stress enough that tennis is a game of options. If you have unorthodox grips, but you find that they are both natural and effective for you, think long and hard before changing to something else.